Over the last few years, more opportunities have emerged for companies to go global with their businesses. Advanced technologies, growing economies, access to new markets and a skilled workforce are all factors that motivate companies to expand outside their borders. When considering expanding internationally however, many businesses think that the only one way to achieve this goal is by setting up their own entity in a foreign country. If a company is building infrastructure and has set longterm plans for the country, then establishing an entity may well be the best solution. However, if a company is looking for a more cost effective and fast way to expand their business and hire workers then an Employer of Record (EOR) solution could be considered. The costs of setting up a foreign entity varies dramatically from country to country and depends on a wide range. Besides the costs of a physical structure/address, companies will have to register with local tax and labour authorities, open bank accounts, set up payrolls and link up with the correct official authorities. Liaising with specialist tax accountants and employment lawyers will also be necessary and the costs can be exponential. Once an entity has been established, there are ongoing maintenance costs to ensure the structure is always operating in accordance with local requirements, as to avoid unforeseen risks and financial loss. These ongoing maintenance costs can vary depending on the number of employees, new hiring and terminations. Shutting down operations (if things do not work out) is no different as it also involves both significant cost and time, as in some countries the bureaucracy involved in closing an entity is even worse than establishing. When the company decides to dissolve the entity, this could take anything from a few weeks to several years depending on the country, the type of operations, the building owned (if any) and the number of employees. Employer of Record (EOR) also known as International PEO is a global employment solution whereby a thirdparty provider hires your employees on your behalf. The EOR provider becomes the legal employer and takes responsibility for the entire employment relationship, employment benefits and HR. The end client company manages only the day- to- day responsibilities. If a business is looking for a quick expansion strategy that enables them to employ remote workers in different countries at the same time, then EOR solutions will help achieve this goal. This is a great way to test the market without having to set up a subsidiary. EOR solutions make it easier for businesses to expand into new international markets quickly and in a safe and potentially profitable manner. Valued workers may move to a different country for personal or other reasons and if a business does not have an entity in that country, they risk losing their services for good. An EOR solution allows a business to retain such workers and operate and employ in a safe and compliant way. Alternatively, if a business has completed a merger and acquisition and has acquired workers based in a country where they do not have an entity, an EOR solution can help the transition. By using International PEO/EOR solutions businesses can avoid having to set up a new entity and have the workers quickly and legally employed without the burden of establishing a corporate entity. WHY USE AN EMPLOYER OF RECORD PROVIDER? If a business chooses to use EOR solutions, they can be present in a new international market without all the hassle of setting up an entity. With EOR, there is no need to engage with lawyers, solicitors, banks or foreign tax authorities because the EOR provider ensures that all workers are legally and fully compliant to provide services in the new markets in a matter of days. In the following section, to better illustrate the cost of employing via your own entity versus utilising an EOR provider, we provide two separate graphs. 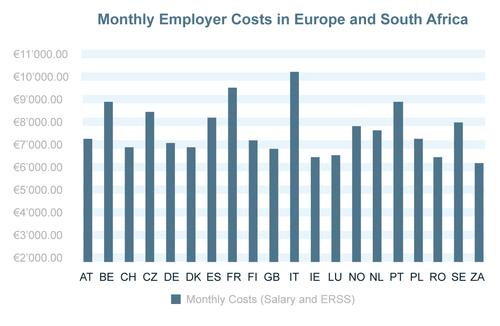 The first graph shows the total cost of employing a worker across a range of European countries and also South Africa. It should be noted that these include all mandatory employer’s costs in that country but not the EOR providers fee. 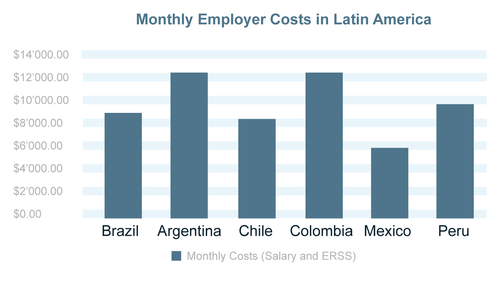 As you can see from the above the monthly employer’s costs vary dramatically in each country. Some countries such as Ireland and Luxembourg have very low employer costs while other countries such as Italy, Belgium, France and Portugal have far higher employer costs. In the second graph, we highlight the difference in the cost of setting up an entity and employing directly versus using an EOR Provider. Personal Factors: age of the employee, location, type of job and salary. Social Security Costs: There are caps and ceilings for the social security costs, which can change the figures for each country. Accruals: These extra costs need to be considered for. E.g. 13th and 14th salary, holiday pay, etc. Switzerland: In some countries, the age of an employee can affect the amount of ERSS. For example, in Switzerland employees and employers make contributions to the statutory pension fund but the rates vary depending on the individual’s age. Germany: Social security costs are capped in each country and can vary depending on age, salary levels and seniority of the individual. For example, in Germany, employers contribute according to the level of benefit and employee’s seniority. Netherlands: Accruals are mandatory extra payments that are given in certain countries. For example, in the Netherlands, workers receive holiday pay, and this is normally paid out in either May or June each year. As we have done for Europe and South Africa, below you will find the same two graphs but for a range of countries across Latin America. From the graph above, you can see that the costs of setting up and employing directly in Latin America are normally 35%-45% higher than to employ via an EOR provider. The reason for the increase is due to all the costs involved with the local structure such as physical office, accountants, legal advisors and back office staff. Whether the worker is being employed directly by the company, or by an EOR provider, it has to be noted that the Employer costs can vary due to many personal factors, including; age of the employee, location, type of job being carried and salary. Another important aspect of international expansion success is cultural acceptance. This is the knowledge and understanding that although we all have our similarities, no country, or region in the world, is the same when it comes to legislation and requirements. Brazil, Chile and Mexico have been compared to highlight this exact point. Brazil: Registering an entity, in what’s considered Latin America’s largest country, can take anywhere between 90 to 120 days, based on World Bank Report, Ease of Doing Business. Once the entity is established, another challenge arises, which is to set up an in-country payroll. The latest news in this area is the implementation of eSocial, a new online payroll system introduced by the Brazilian government in September 2018. The eSocial Platform will require all companies in Brazil to submit their payroll information to the Brazilian government. All other payroll data used and sold by private companies in Brazil are being configured to integrate with eSocial, as the fines for not following government timeframes and requirements are quite high. Chile: According to the World Bank, Chile is one of the highest ranked countries in Latin America for ease of doing business, specifically, compared to other countries in Latin America, Chile is less restrictive when setting up an entity. However, when it comes to labour relations and HR practices in Chile, the system is very complex as employment costs are calculated based on UTM (monetary tax unit) which varies monthly. Mexico: When it comes to entity registration, Mexico has improved tremendously in the past decades for businesses looking to set up an entity there. Direct hiring is still difficult though as Mexico has 17 different types of employer’s costs, all of which vary according to the salary level and monthly variables paid to the worker. Even though Mexican Labour Law can be flexible when it comes to employment contract legislation, the actual payroll management continues to be quite demanding. As mentioned at the beginning of this article, many businesses think there is only one way to expand internationally – via the set-up of a formal entity. It is certainly true that this option can work extremely well for companies who are building infrastructure and have pre-defined long-term plans for the country. However, if a business is looking to expand quickly without delays then working with an EOR provider could be the solution. As more companies plan to expand their business globally, it is important to understand that employing abroad directly can be a complex process. Each country has their own rules and regulations regarding compliance, regulatory frameworks, employment laws and taxes. Communicating with specialist tax accountants and employment lawyers will also be necessary, and those costs can rise very quickly. Therefore, setting up an entity can become a costly and time-consuming process which can prove a real distraction to core business. If a business is looking to expand into a more developed economy in Europe or test a potential market in Latin America, EOR could be a better solution to setting up an entity. An EOR solution is a more cost-effective and faster way to expand a business and hire workers in a foreign country compliantly. Businesses can hire internationally without risk and be operational in a few days without having to set up an entity allowing more time to focus on their core business. Whether your company is looking to expand into Europe, Latin America, South Africa or Asia, Capital GES can help. Our team consists of dedicated international in-country specialists who are on-hand to provide round-the-clock support whenever our clients need them.